In some of my previous Driver’s License Restoration blog articles, I have conducted a detailed examination of the Substance Abuse Evaluation that must be filed to begin a Michigan Driver’s License Restoration or out-of-state Clearance case. I refer each new Client to a local Clinic to have their Evaluation completed. In this article, I want to focus on the fact that almost every “outside” Substance Abuse Evaluation I see is NOT done correctly, and why this is so important. Without exception, it has been my experience that any Evaluation done before I’ve first met with a new Client first has been unusable. As a Michigan Driver’s License Restoration Lawyer, it is my job to assemble and double-check the evidence submitted in any License Appeal I handle. The Substance Abuse Evaluation is the single most important piece of evidence in a License Restoration case. In my Practice, I exercise extremely tight control over who does my Evaluations, and how they’re done. On top of that, they are checked, checked again, and re-checked before I ever give them the “okay” and send them off to the State. My “quality control” measures begin at the very first meeting with a new Client. That meeting is scheduled before the Client undergoes his or her Substance Abuse Evaluation. It takes about 3 hours, and the whole focus is to prepare the person for their upcoming Evaluation. An important part of those 3 hours is the completion of my own “Substance Abuse Evaluation Checklist,” which is a proprietary document I have created based upon decades of experience handling and winning Michigan License Appeals. This “Checklist” is filled out as the Client and I go over the actual Evaluation form, line-by-line, and a copy is sent with them to give to the Evaluator so that no detail is overlooked or otherwise not done correctly as the actual Substance Abuse Evaluation is completed. There is a good chance that anyone who has previously tried a License Appeal and lost was Denied because of a “questionable/insufficient Substance Abuse Evaluation.” A problem with the Evaluation is one of the most common reasons a Michigan License Restoration Appeal case loses. I make sure that doesn’t happen, and for all my efforts, I back them up with a Guarantee. Anyone hiring me for their License Restoration case will be directed to the local Clinic that I use to have my Evaluations completed. Out-of-state Clients will usually schedule their meeting with me the same day as their Evaluation, and then leave from my Office and go directly to meet with the Evaluator. While I strongly encourage my Clients to use this local Clinic, it’s probably not for any of the reasons the reader might at first suspect. This Clinic does a first-rate job on the Evaluations, and I cover any and all contingencies with my “Substance Abuse Evaluation Checklist.” They have the highest degree of integrity, and the Michigan Secretary of State’s Driver Assessment and Appeal Division (DAAD) knows that, because this Clinic has never tried to do any kind of “snow job” on an Evaluation. In other words, they produce a clinically accurate document, and not some kind of favorable “report for hire.” This is important. Think about it; if they just took their fee to generate a glowing, favorable (meaning b.s.) report, I certainly wouldn’t need 3 hours to go over the Evaluation form line by line with a new Client to make sure they do well on it, nor would I need a checklist to send with them to insure that. In the history of Michigan License Appeals, there have been various Clinics that have made a lot of money over a short period of time by cranking out favorable Evaluation after favorable Evaluation. The State caught on to that game decades ago, so anyone trying that approach won’t get past the front door. As a bonus, the local Clinic I use charges less than most other places, which is kind of ironic. I’ve seen Evaluations costing twice as much that fell far short of being half as good. This essentially puts the Hearing Officer under a negative mandate, meaning he or she has been directed to look for a reason or reasons to DENY a License Appeal, rather than look for a reason to Grant it. While this may seem strange at first glance, to anyone who has tried this before (and lost), it undoubtedly makes sense. Thus, with the Substance Abuse Evaluation as the very foundation of a Michigan License Appeal, it becomes important to make sure it is “air-tight.” The problem with that is that very few Evaluators really know how to do that. This is not a knock against the general field of Substance Abuse Counselors, but, if anything, a knock against the State for creating this conundrum in the first place. There’s no denying the fact that the State could do a much better job of explaining things better. The Substance Abuse Evaluation form, at least to any Counselor, looks straightforward enough. It really asks about nothing unfamiliar to someone who counsels people with drug and alcohol problems. As a result, any such Counselor will have little reason to think they can’t complete one after reading it over. Somewhat regularly, I’ll meet a new Client who found this blog, or my site, after they had their Evaluation completed, but before they have actually filed it. As they do their research on my site, and perhaps elsewhere, they realize that a “do-it-yourself” License Appeal is almost always a sure loser. They contact me, and set up an appointment, indicating that they’ll gladly follow my instructions, but that they’d at least like to bring the Evaluation they already had done and have me look at it. Of course, I agree, partly out of courtesy and partly out of curiosity, because over the course of 22 years, I have only seen a couple of Evaluations done elsewhere that I have found adequate. Usually, I don’t have to read very far before I can begin pointing out to my new Client why the Evaluation they have brought in would have cause their Appeal to lose. From there, the errors and omissions usually just keep piling up. As I pointed out before, however, this really isn’t the fault of the Evaluator, although hearing that would only be cold comfort to anyone who lost their License Appeal because of a problem with their Substance Abuse Evaluation. In fact, there’s a very good reason most Evaluators have trouble getting the form done the way the State likes it. No one has ever explained to them what the DAAD wants in an Evaluation. They’ve never been told about what kind of information is harmful versus helpful, and what kind details the DAAD is looking for. 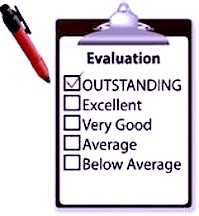 Some of the small print on the Evaluation form is some of the most important. Those Evaluators who really do it right are those who work very closely with someone like me, who spends most of his time working on License Appeal cases. And by closely, I mean that they have frequent and regular and communication about License Appeal and the role of the Substance Abuse Evaluation, and don’t just get a steady stream of referrals to do them. Say Carl the Client comes into a Clinic to have his Evaluation completed. He gets it, files it, goes to his License Appeal Hearing, and wins. He’s undoubtedly happy, but do you think he ever read the Order from the State, detailing why he won, and then called the Clinic to say “Hey guys, I just wanted to tell you that in his Opinion Granting my License, the Hearing Officer pointed out these things you put in your Evaluation that apparently were spot-on, and helped me”? Of course not! Carl won his case, and that was that. What if Carl loses, however, and the Hearing Officer pointed out some deficiency in his Evaluation as the reason for his Denial? Do you think Carl called the Clinic and said, “I just wanted to let you know that you didn’t mention that I had tried Marijuana in the Evaluation, and you didn’t really bring it up when I met with you, but I was asked about it at the Hearing; that’s mentioned as part of the reason I lost my Appeal”? Again, the answer is, of course not! In other words, Substance Abuse Evaluators are mostly left to “fly blind.” They don’t get any feedback, good or bad, from which they can adjust how they do things. Let me ask anyone reading this who has lost a prior case for some reason related to the Substance Abuse Evaluation: Did you call the Evaluator? Part of my relationship with my local Clinic, as well as the other Evaluators I sometimes use, is to always communicate with them, and give them feedback so that they know exactly what the State wants in terms of information and detail. One thing any Hearing Officer never wants to see is an Evaluation form with the words “see attached” typed upon it. The whole point of a 2-sided form is to provide all the essential information within the body of that form, and not make “a mountain out of a molehill.” Yet plenty of inexperienced Evaluators do just that, perhaps mistaking the quantity of words on the Evaluation for the quality of such words. It is imperative that an Evaluator knows precisely what kind of detail to provide, and why the State wants it in the first place. They can only get that through regular communication with a Driver’s License Restoration Lawyer, like me. The flip side of such communication is that the Lawyer learns more about the Clinical end of things, as well. In my case, for example, my interest is so keen that I decided to enter a post-graduate University program in alcohol and addiction studies. In a certain way, you really want your Evaluator to be little bit of a Lawyer, and you want your Lawyer to be a little bit of an Evaluator. I will continue, I’m sure, to see more “outside” Evaluations in the future. Whatever else, it’s a good thing that I have a chance to see them fist, and prevent them from being filed with the State before a person gets locked into a losing document. At least this way, I can exercise that appropriate degree of control over each case, and I can make sure the right evidence is submitted to the State. This, in turn allows me to Guarantee a win in every Michigan License Restoration or Clearance case that I file.